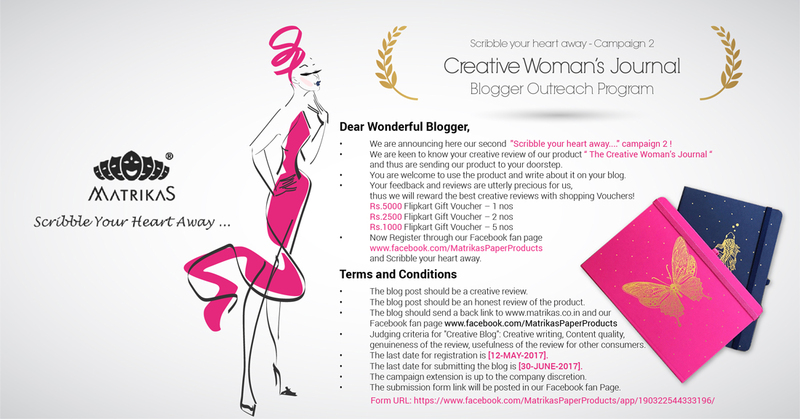 Matrikas Paper Products have announced "Scribble your heart away….” Campaign 2 after the grand succcess of the first campaign last year. Their paper products are amazing and you will want to buy them from the market or here is a chance to get them sent to you if you a blogger. They are keen to know your creative review of their Creative Woman’s Journal product and thus are sending the same product to your doorstep. This journal comes in 4 different colors and you can choose which on you want to write about. You are welcome to use the product and write about it on your blog and end date of writing about the product is 30 June 2017. You can also introduce your 5 blogger friends and win yourself Rs.250/- worth Flipkart Gift Vouchers too.